Run Crazy Horse, a brand new running event, is coming to South Dakota’s Black Hills on Oct. 3, 2010. Run Crazy Horse will be a marathon and half marathon taking runners through the scenic Central Hills between the Crazy Horse Memorial and downtown Hill City. The best part could be the name of the man who is putting it on. Jerry Dunn is a veteran marathoner and race organizer, a guy who knows how to put on a successful event. 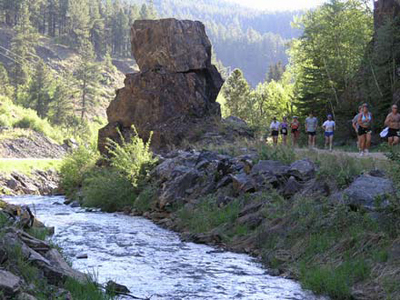 Jerry created and stages the Deadwood Mickelson Trail Marathon, the popular Northern Hills event that takes place on the Mickelson Trial between Rochford and Deadwood. Runners from 47 states have been participating in recent years. He also stages the annual Lean Horse Ultra in the Southern Hills. And he helps his wife, Elaine Doll, stage the Leading Ladies Marathon through Spearfish Canyon. Jerry is teaming up with the Hill City Chamber of Commerce, Crazy Horse Memorial, Native American Natural Foods – the Kyle, S.D.,-based maker of the Tanka Bar -- and perhaps the Black Hill Runners Club to put on Run Crazy Horse. He said the marathon and half marathon are just the start of what he hopes will become a big annual running event for a variety of ages and athletic abilities. In future years he wants to add relays and running events for children. “Part of what we’re all about with this new event it to improve the health of Native American youth,” Jerry said.With the support of Tanka Bar and the Crazy Horse Memorial, Run Crazy Horse should be very visible to Native American youth. Hill City is excited about the new event. The Hill City Area Chamber of Commerce there has been actively involved in putting the Run Crazy Horse together. On the route that has been sketched out, runners will start near the Crazy Horse Visitor Center. Much of the route will be on the Mickelson Trail. Half-marathoners will finish on Hill City’s Main Street. The full marathoners will continue north on a loop that includes Major Lake Road before looping back to Hill City’s Main Street finish line. Dunn emphasized that Run Crazy Horse is a completely new event; he’s not taking over the Mount Rushmore-Crazy Horse Marathon, also called the Monumental Challenge Marathon. The status of that race, usually held in early October, is unknown. The operator of that marathon scratched the 2009 race, citing financial problems. No announcement has been made about 2010. Dan is an on-again, off-again Black Hills resident since 1978. The Aberdeen native hit the road after high school, building houses in Boulder, working oil rigs on Colorado's Western Slope, delivering cars in California. In Wyoming and Idaho, he worked as a newspaper journalist. But the Black Hills kept luring him back. For 18 years, he wrote for the Rapid City Journal. The job gave him a chance to see the Hills from atop Mount Rushmore and the bottom of the Homestake Mine. Whenever possible, Dan grabs his dog Kody and heads to the Hills. These days, he's perfecting the art of low-impact backpacking: hike two hours to a scenic spot, break out the wine, cook up the pasta, watch the sunset and fall asleep under the stars.